Pound cake has a buttery flavor. Using vanilla buttercream on pound cake is a quick way to add an extra sweet twist to the dessert. It also adds an extra-rich taste and texture. Pound cake is a heavy cake with a creamy flavor, so any frosting you use needs to pair well with the buttery base. Vanilla not only pairs well with butter, it’s as versatile as butter when it comes to flavor pairing. 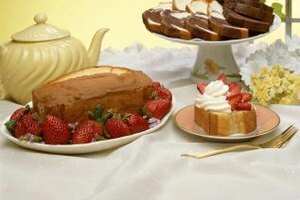 Pound cake traditionally contains butter, sugar, flour and eggs. It may also contain flavoring, such as vanilla, or te-xtureenhancing ingredients, such as nuts. Vanilla buttercream frosting contains powdered sugar, butter, milk and vanilla extract. Since two base ingredients in both the cake and frosting are the same, the buttercream echoes the flavor of the pound cake, which makes it a suitable flavor pairing. The secret to frosting pound cake with buttercream is to allow the cake to cool completely before frosting -- otherwise you may end up with ripped cake or melted buttercream. Do You Need to Refrigerate Whipped Cream or Buttercream Frosting?